There is a very wide variety of types of canoe you can try, with a variety of styles. The canoe can hold one, two or more people, you can either sit or kneel inside, the paddle can have one or two blades, and the boat can either be closed or open. Within these broad categories there are further distinctions, between boats suitable for the sea, those specially for white water rivers, and even ones specially for 'tricks'. Adding to these is a relative newcomer, the inflatable canoe. These can be one- or two-seater boats, built like a small raft. You sit on top, rather than inside, and they're self-bailing just like a raft. The major advantage of these boats is their stability, so complete beginners can get out in the (slightly) rougher water straight away, without having to master the tricky balance of a less-stable kayak. The main disadvantage is the name, as they've rather inadvisedly been named "funyaks". The chances are, for whatever kind of canoe and whatever kind of water you're interested in, there will be a course somewhere for you. Often the same places that offer rafting day trips will offer canoes of some kind as well. 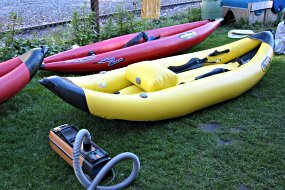 At the place we used, in Versams in Switzerland, they offered kayaks, Canadian canoes and inflatable kayaks, as well as the more popular rafting trips. 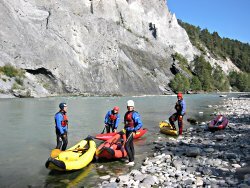 Whereas the rafting trips give you immediate excitement but little individual control, the kayak courses offer very precise control after a lengthy introduction. 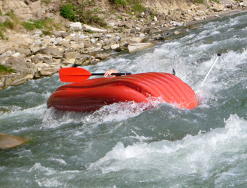 The inflatable kayaks give some kind of middle ground, with immediate immersion on easy rough water, while still giving you control. Thus you can start with a day outing instead of a 3-day course. We tried out a one-day course on the inflatable kayaks, the so-called "funyaks". This costed CHF120 for the day, with the optional lunch costing extra. It was run by Kanuschule.ch, in an ideal location at Versam-Safiens in Graubünden, near Flims. The first thing to do is to get acquainted with the equipment. With these water temperatures, the most important piece of kit is the wetsuit, which they provide along with wetsuit socks and even training shoes as well. Depending on the season you can also take a fleece top and/or a thin jacket, before taking the life jacket and helmet. As long as you brought along your swim gear, you're set to go. The boats themselves are very simple, needing only to be unrolled and inflated to be made ready. This is much easier with a vacuum cleaner! You'll notice that you sit very much on top of the boat, rather than tucked inside like a kayak. You have a backrest of some kind, maybe footrests, and some straps under which you can hook your knees for extra support. So the only thing missing now is the paddle, which is double-ended like a regular kayak paddle, with the blades set at 90 degrees to each other. Having carried the kayaks down to the river, and after admiring the spectacular views, the next thing to do was to go for a quick swim. This was more to get used to the water temperature than to teach any complicated survival techniques, but it's good to not get a shock the first time you fall in. And it gets the wetsuit doing its job. There wasn't much to teach about the basics, apart from to get the paddle the right way round, and off you go. Of course, there's more to it than that, but just to get going on the flat water is a piece of cake. Forward to go forwards, backwards to go back. There's no need to teach the notorious "eskimo roll" here, because if you do tip up, all that happens is you move your knees out of the straps and you swim free. Then turn it back upright and climb on - it'll bail itself. After some experimentation, we had some more talk about technique, fine-tuning the movement to involve twisting the whole upper body rather than just pulling with the arms. We also went through the principles of leverage, and how the position of the blade affects the pull on the water. With these extra things to think about, we then tried it out again on some faster water, moving around through the flow. This soon brought the first spill, when the water was churned up by a large rock, and the subsequent whorls dragged the upstream side of the canoe down, neatly flipping it over. Cue one brief swim and a clamber back aboard. One more discovery - paddling upstream can take it out of your arms - the ideas are easy, but getting the most efficient technique isn't. It wasn't long before we were very ready for the lunchtime break. Back on with the damp wetsuits and back down to the river for another go. From here it's about 7km as the crow flies to Reichenau, although obviously further on a twisty river. The water was a mix of slow, flat sections and faster, more turbulent bits, and was surrounded by spectacular scenery. There weren't any seriously wild bits (the rafts in particular were finding it very easy-going), but in a low canoe there was plenty of face-splashing and more than one capsize. There were a couple of fairly incidental interruptions to our trip, firstly an excursion on foot up a narrow side-gorge (pleasant, but a bit random in my opinion), and secondly a spree of flinging ourselves off a large rock into the deep river (more fun). Because of our slow pace, and regular stops to regroup, we took quite a while to get down to Reichenau, taking it at our leisure and enjoying the scenery. Eventually we reached the take-out point, and then had a 10-minute walk carrying the canoes to the station of Reichenau-Tamins. Here we discerned another advantage of the inflatable kayaks - you can fold them up and carry them on the train for free! A short train ride then took us back to Versam-Safiens, where we could pack up the gear and get changed. Obviously the conditions in the river vary a lot depending on the rainfall and snowmelt through the Summer - apparently June/July gets the fastest water. 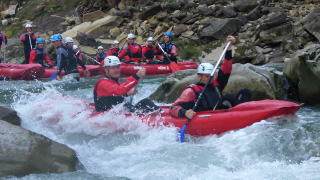 In September there weren't any heart-stopping rapids to contend with, but you don't get those on a one-day beginners' course. Where we were, it looked a bit tame for the rafting, as they just floated over our Grade I to II waves, but they also ran the II to III water higher up, and certainly looked to be enjoying themselves. In the inflatable kayaks, it was definitely an interesting and enjoyable day out, with enough rough stuff to throw you in if you weren't careful. Included in the CHF120 was all the equipment, the guide, and the train back from Reichenau-Tamins to Versam-Safiens. Not included was lunch (an extra CHF24 for bbq and salad), a shower (sorry, no) and of course transport to and from Versam (CHF40 return from Zürich with halbtax). And the post-trip beer in the bar next door. If you happen to be in Austria, there's an activity centre called High 5 which offers, among many other things, inflatable canoeing. They have lots of good equipment, good water and competent instructors, but it's not especially cheap. Without a dedicated photographer, the camera had to stay in the watertight box for most of the interesting bits, so sorry for the lack of action photos. Kanuschule.ch - Centre in the Vorderrhein, including normal kayaks, Canadian canoes and rafts. 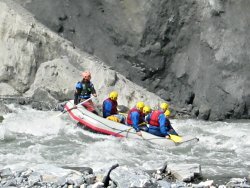 Railaway.ch - Occasionally has offers for half-day rafting trips in Switzerland, including train there and back. Page last updated September 2013. Feedback welcome at mail@activityworkshop.net.